Fast rising British rapper Stephanie Victoria Allen popularly known as Stefflon Don has confirmed to be in a relationship with Nigerian Afro-beat star, Burna Boy. Burna Boy may have confirmed that its true they are dating after sharing a nine seconds loved up video with the British rapper which was immediately deleted. 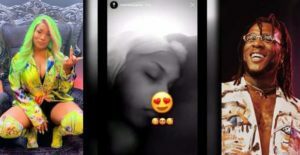 Few hours after the video had gone viral, she wrote a message a on her instagram story confirming that Burna Boy is her new boo.